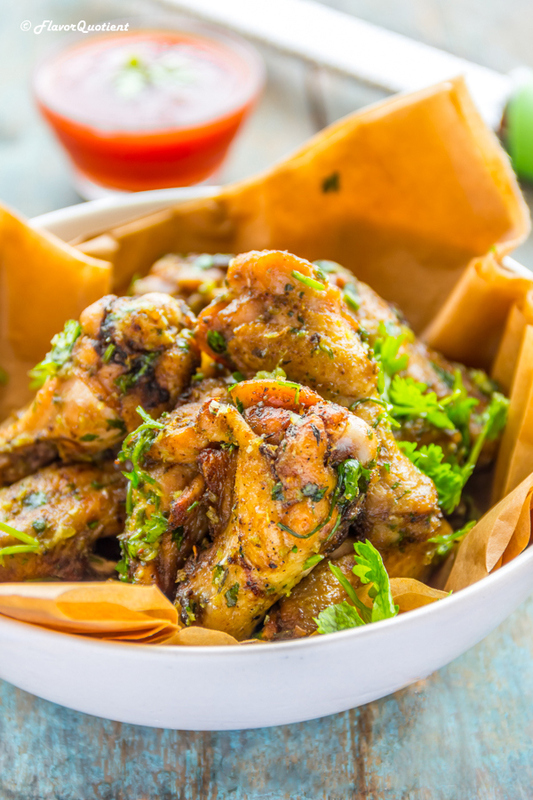 A superbly easy and quick chicken wings recipe to keep handy for that sudden party where your friends self-invite themselves only because of the popularity of your culinary skills and you can’t let yourself disappoint them! 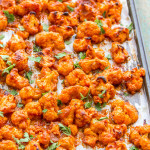 The current trend of super-quick and over-the-top recipe videos set by the viral YouTube channel Tasty has taken the Internet culinary world by storm. Everyone likes them! Even if they like to cook or not, they like to see such amazing food being created in no time in front of their eyes! Cooking being so close to my heart, it’s no surprise that I am simply bowled over by these jazzy videos and watch them over and over again! 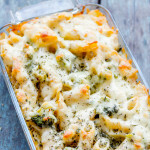 My today’s recipe is sourced from one of those many Tasty videos! These baked garlic parmesan chicken wings looked so promising to me that I could not escape from its temptation. All the ingredients being available in my pantry at once made my life a lot easier. This is what I call the signals from destiny which was indicating that I was destined to relish these delicious chicken wings very soon! I would strongly suggest you to always keep a pack of chicken wings handy in your freezer. They cook very fast and almost every chicken-eater like them. 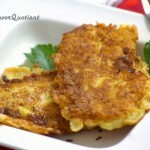 This could be a crowd pleaser or can help you satisfy your sudden cravings for some crispy chicken. 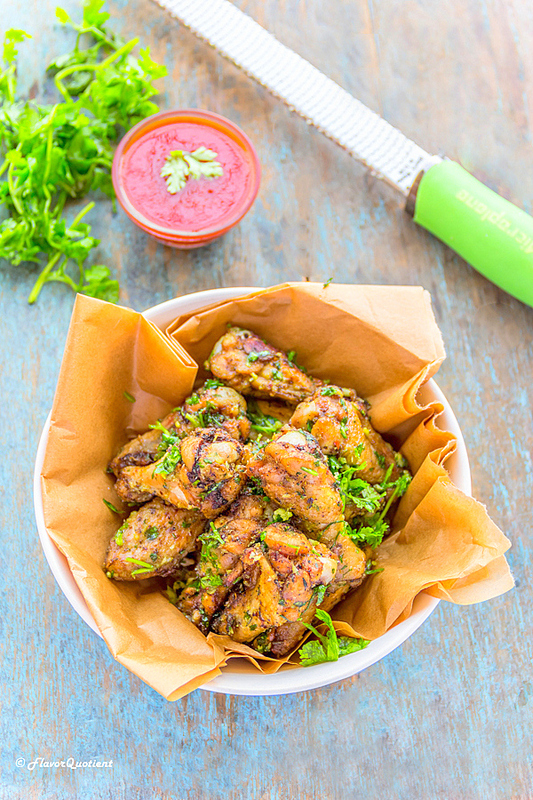 Chicken wings is a winner in all fields, so you got to have them in your life… permanently! 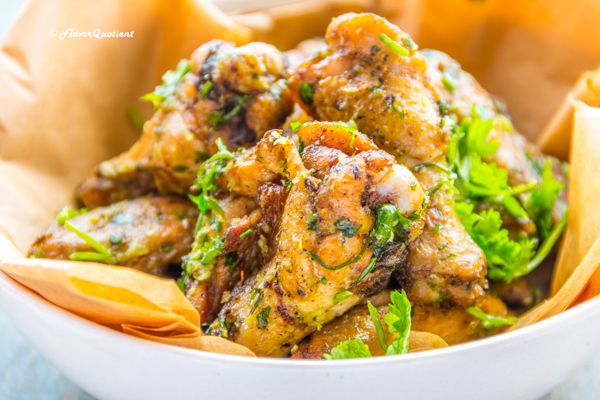 For baking the wings you must have the skin-on version, for baking any chicken portion for that matter as the skin helps to seal in the juice keeping the meat succulent inside. The skin itself turns very crispy leaving you with a killer combination of crunchy yet tender chicken! 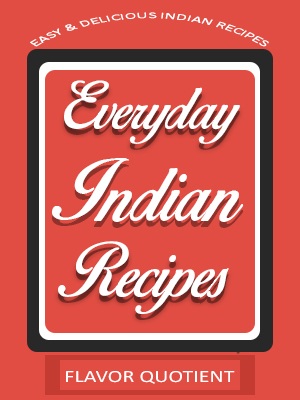 If you are a regular reader of my blog, you may know that it is highly skewed towards chicken recipes. While adding one more to my repertoire, I was wondering if I am being unfair to the vegetarian recipes of mine. I do have few veg recipes lined up but due to my weakness for chicken, this baked chicken wings recipe won the race. But I promise to you all – especially to my veg-loving readers – I will be back with a super-delish vegetarian recipe in no time at all. It will be full of all summer goodness and a colorful combination of ultimate flavors married all together! But for today, let’s pounce on these babies, I mean these cute little chicken wings! Preheat your oven to 150 C / 300 F and place the wire rack at lower level of the oven. Wash and pat dry the chicken wings. A single wing has two joints and cutting them through the joints results into 3 pieces. Discard the piece with tip of the wing and use rest two. Mix Italian seasoning, cumin powder, salt and pepper to taste in a large bowl. Add the chicken wings to the bowl and coat with the spice mixture. 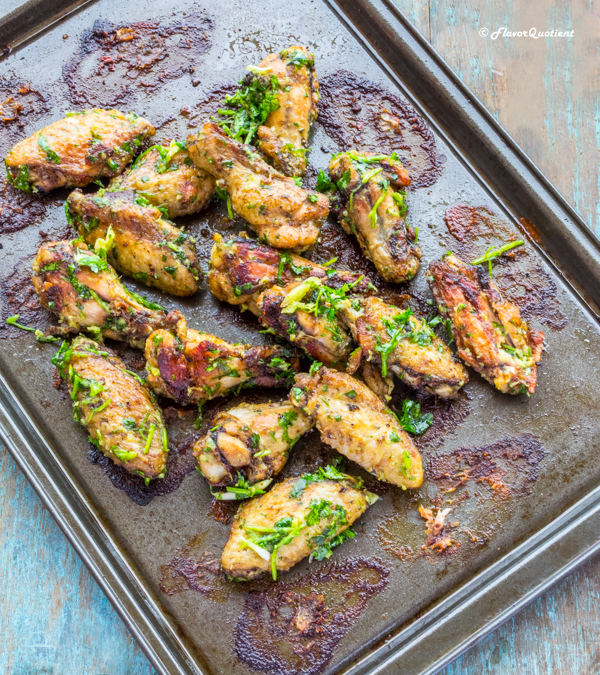 Transfer wings on to a baking sheet and bake for 20 minutes. Then increase the oven temperature to 220 C / 425 F and bake the chicken wings for another 15 minutes. 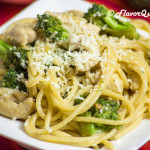 While the chicken is baking, mix together the grated parmesan cheese, minced garlic, oil and fresh chopped parsley. 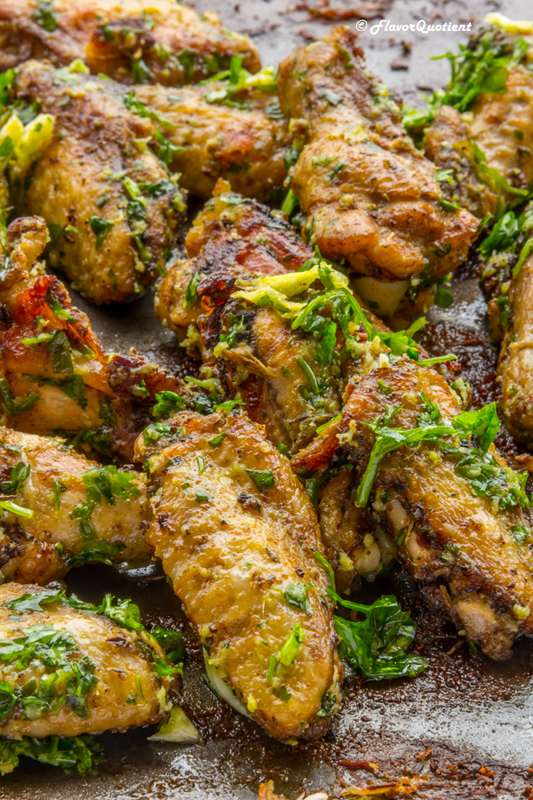 When the chicken wings are cooked through, toss them in the garlic-cheese-olive oil mixture. 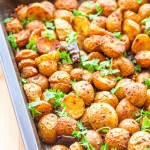 Place them again on the baking sheet and broil at 220 C for exactly 5 minutes, but do keep an eye on them as even few seconds extra can ruin the whole dish. Serve hot immediately with ketchup or mayo on the side. Well, looks light tonight’s wing night at my place! These look stinking amazing, and I know my hubby won’t disagree. Love!!!! Am so glad to hear this! Enjoy!